The main audio amplifier in my home theater. It is connected to my PC with a coaxial S/PDIF connection for normal (stereo) operation AND analog stereo mini-jack for. It is automatically controlled by my PC through its serial port. Old beamer that has a native resolution of 640x480. However, color reproduction is quite good and screendoor effect is not that noticable. Homebrew. Currently only supports RC5 remove signals (Philips). Works in combination with a special plugin for EventGhost (see software). Homebrew. Used to control the lights in my room. Works in commbination with a special plugin for EventGhost (see software). The 'core' of my HomeTheater. I have chosen this player, since it is highly configurable and because it can be controlled by other applications. However, sometimes the options are a bit too much. EventGhost is a open source automation tool for Windows. 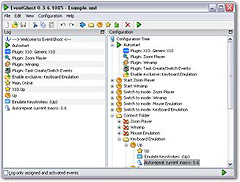 Before I used Girder, but since the Girder group switched it to a commercial tool and plugin specification was not open anymore, I switched to EventGhost. EventGhost has a more consistent structure and it can easily be extended by writing custom plugins (in Python). Used to skip those VERY ANNOYING copyright announcements and menus when playing DVD and just go to the main movie directly. Great tool anyway! Generates random automatic playlists to a user settable pattern. Also a check is performed to see whether all playlist files are available BEFORE starting the player. ZoomAssist was previously also used as an automation tool BESIDES Girder. However, the original planned event-based scripting engine turned out to be already implemented (way more flexible and extendable) in the EventGhost platform. Therefore, all the control the logic is now ported to EventGhost and a few custom plugins. Homebrew application to control my Marantz receiver through its serial port. It allows me to control the volume, input selection, mute etc etc directly from my keyboard. Actually not used for my HomeTheater, but all commands are passed through this application from EventGhost. 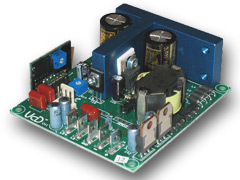 Used for DD/DTS pass-through. It is also used to ENCODE stereo AVI sources to make sure stereo movies are correctly Dolby ProLogic II decoded by my receiver.